Not sure about the rest of the world, but my sources tell me it is for sure being released August/September in North America. All the commotion in the BrickQueen vs BrickSpy thread lead me to think that there should be a general thread dedicated to people like BQ...so discuss here! So BrickQueen filed copyright claims against BrickSpy's news video about her because she felt "attacked". She removed the claims, but it still harmed his channel. I think it's pathetic the way she's acting. What do you guys think? Great review, I'll have to get this one. 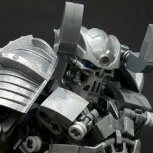 Any chance of getting Takanuva in the future? Haha these are funny. Keep it up! Hi guys, my username is luvembricks, because I luv 'em bricks! This happened to me too. I bought Battle for Ninjago City in October and they charged me three times! It was ridiculous, but they refunded me the overcharges after I complained. Too bad we never got the sub from the movie. I haven't bought Bionicle in years, glad to hear it's back. I might just get a few sets.